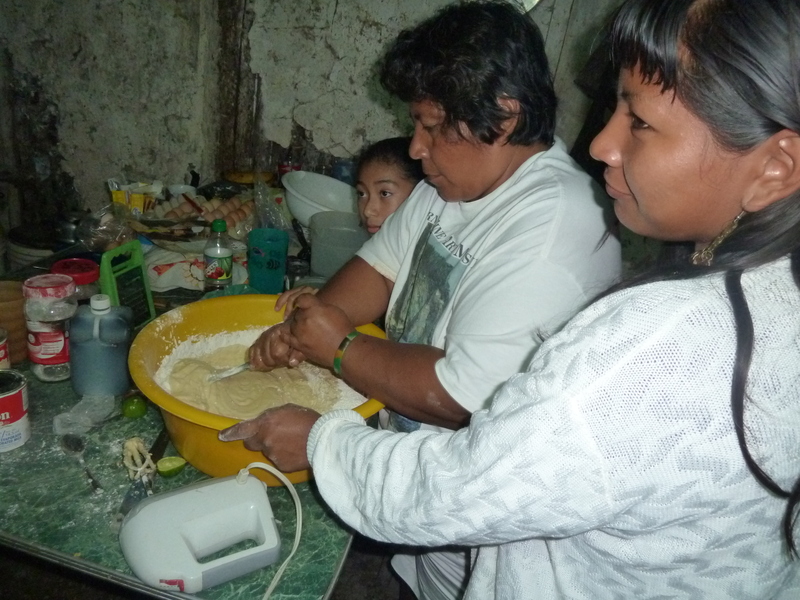 Myrna baking in her kitchen on Christmas night last year with her familia. The weather was clear and cool during that Christmas week in that northern BZ village of San Luis, near the Mexico border. Last week the thatch roof over this kitchen caved in from rain. So goes life in Belize. Since I returned from the States to Belize on Oct. 27, the rainy days and nights have way out-numbered the sunny days and starry nights. It was just last Monday that the one-way “low bridge” into this river town of San Ignacio was finally repaired and reopened because of flooding. That relieved the traffic jamming at the iron “high bridge” that normally leads one way out of town, after many days of the high bridge doing service as the one way in and out of town. Yesterday, the low bridge disappeared under flood waters, again. Saturday is market day and market day today was “muy mojado”–very wet–and as hard as hard rain on the vendors’ pocketbooks, again. The newly repaired “low bridge” leading into the population and market center that is San Ignacio in Belize is under water, again. “Today I am grateful for all the opportunities I have living in this country. I spent Christmas week last year in a little village with my Belizean friends Myrna and “Pops,” who live in the sugar cane region of northern Belize near Mexico. I called Myrna the other dad and she rather nonchalantly mentioned that the thatch roof over their house had caved in from the rain. They weren’t hurt, but they’re living with neighbors till they can recover. 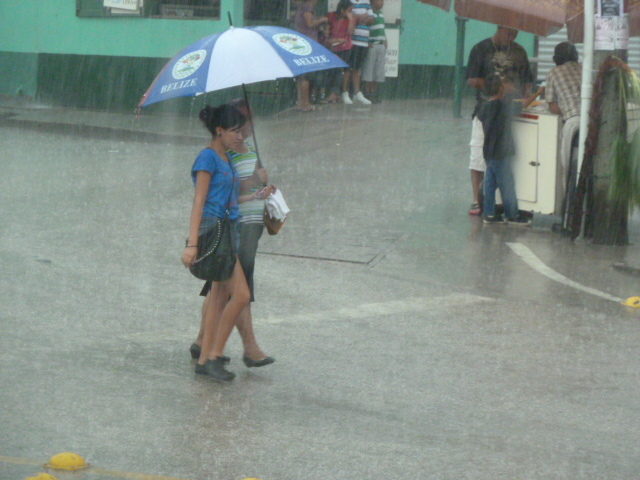 It’s the rainy season in Belize, but there’s rainy seasons and then there’s flood years. I picked up a local paper yesterday and saw the story and picture of a villager I knew when I lived last year in the ancient Mayan Village of San Jose Succotz. The story was that my friend there had drowned trying to cross flood waters in his canoe. 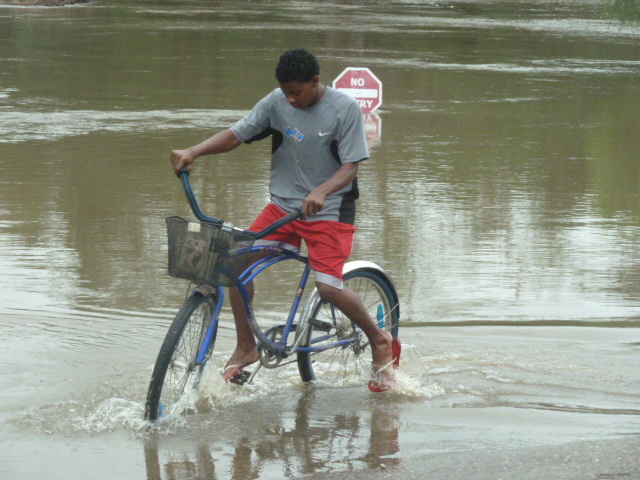 I never knew him well, but well enough that the stories of flood casualties in Belize–and news of whole villages that have been accessible only by boats and canoes since I returned from Texas because of the rainiest year since 2008–struck close to my home. There’s always two ways to think about America–with attitude or gratitude. The sun is peeking through the clouds now and I am welling up in this funk of mine with gratitude. 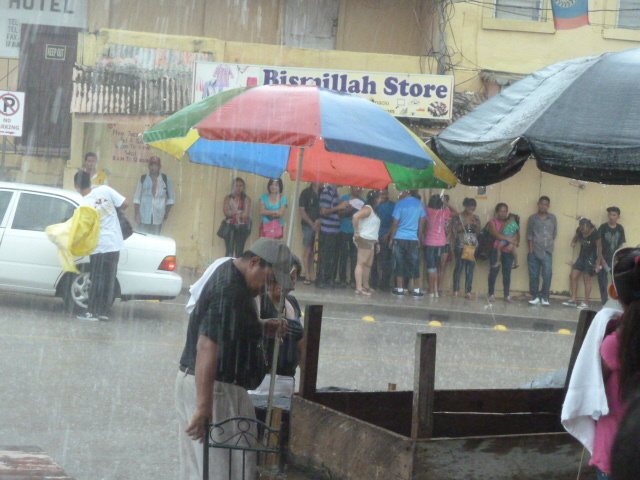 Rain or shine, shopping on market day is a must for many in the San Ignacio/Santa Elena area.